Sol, as he is known, has been acting since the age of 12. He is highly active in the community and has traveled to South America since he was 17 to volunteer as a social activist and prepare himself in his artistic endeavors. Sol is a certified capoeira (Brazilian martial arts) instructor, poet and hip-hop artist. He appeared at Miracle previously in Conquista Rebellion as a warrior and is thrilled to work on this magnificent, magical production. has come to Portland by way of Italy, New York and Romania. He is a graduate of the Institute for Theatre and Film in Bucharest, Romania and for a short period afterwards was a staff director at the theatre Notara in Bucharest. In 1982 he was able to escape communist Romania and find political asylum in the USA. His most recent works include Brecht, which he co-wrote and directed in Rome, Italy and Turandot, directed for La Mama, Etc. in NYC. specializes in musical theatre, studied playwrighting and theatre at Havana’s Instituto Superior de Arte and later with famed Cuban designer Rafael D’Leon. Jorge also studied advanced sewing at the Cuban school Alta Costura and worked for six years for Turarte S.A., a Cuban company dedicated to making the most important costumes for musical shows such as the famous Tropicana. During the past three years, he studied in Europe with a dance company called Yoldance and worked on a spectacle called Viva Cuba for which he made most of the costumes. 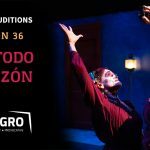 Jorge has worked with North American director Tony Giordano and on Danza Contemporanea de Cuba’s Havana Carnaval, which opened at the National Theatre of Cuba. In Portland, Jorge has crafted projects for the Oregon Ballet Theatre’s production of A Midsummer Night’s Dream with designer Sandra Woodall as well as Miracle Theatre’s production last season of Oyá: Call the Storm. is currently attending UCLA's graduate program in Costume Design for Theater, Film, and Television. She has an Associate's in Apparel Design from The Art Institute of Portland, and a Bachelor's in "From the Visual to the Sartorial: Exploring Art and Costume through History and Design" from the University of Redlands. She has worked on previous productions for the Portland Opera and Quintessence Theater and has enjoyed her first experience with Miracle Theater. actualmente es becario por parte del Fondo Estatal para la Cultura y las Artes de Hidalgo, con el proyecto Teatro Cuerpo Social donde trabaja con niños y jóvenes de las tres zonas indígenas del Estado (otomi, nahua, tepehua). Fue candidato para ingresar al programa artístico The Rolex Mentor and Protege Arts Initiative 2008. Como actor, ha participado en montajes como En la soledad de los campos de algodón, Cada vez que ladran los perros, El Rastro, y Nuestra señora de las nubes. Como bailarín, ha participado en El polvo del camino montaje realizado en tres síntesis (2006, 2005, 2004) con el Laboratorio Escénico Danza Teatro Ritual. En el 2007 auto dirige su primer solo de danza teatro ritual, llamado Árbol de maíz presentado en Real del Monte, Pachuca, Toluca, Guadalajara, Torreón, San Luis Potosí.